Mark Evans has nearly 35 years experience in pre-press and digital printing technologies. He joined EXILE Technologies (originally OYO Instruments) in 2001 and is currently managing director of EXILE Technologies Limted which handles sales and support for all EXILE's Imaging products in Europe, Africa, the Middle East and the Indian Subcon- tinent. He has extensive experience EXILE's SPYDER, SPYDER II and FREEStyler Computer to Screen systems, overseeing numerous CtS installations across the UK and Europe in the last 5 years. 2 0 1 9 M A R C H P R I N T W E A R 5 9 different from typical spot-color jobs. If you do transfer prints as well as direct textile prints, these will usually require different pre-press setups. Once a calibration curve has been cor- rectly set up for a pre-press workflow, it should not need to be changed unless you make changes to your other pre-press set- tings or if you change to a different type of screen emulsion. That being said, it is very common to have multiple workflows with different settings for printing onto different types of substrates. Once the screen has been imaged, what other differences are there in the screen pro- duction workflow? One of the great benefits of a CTS stencil is that it can be exposed without the need for a glass or vacuum. 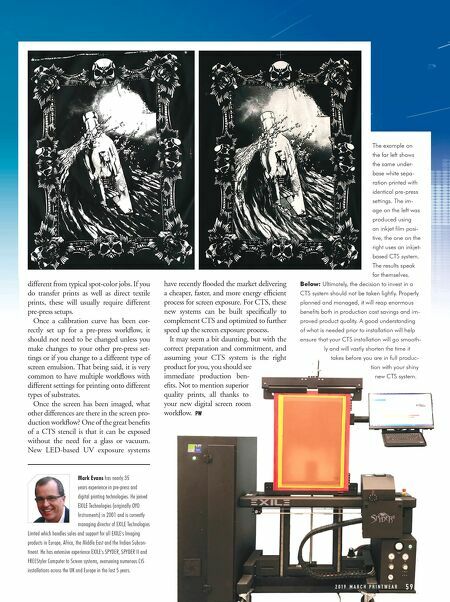 New LED-based UV exposure systems have recently flooded the market delivering a cheaper, faster, and more energy efficient process for screen exposure. For CTS, these new systems can be built specifically to complement CTS and optimized to further speed up the screen exposure process. 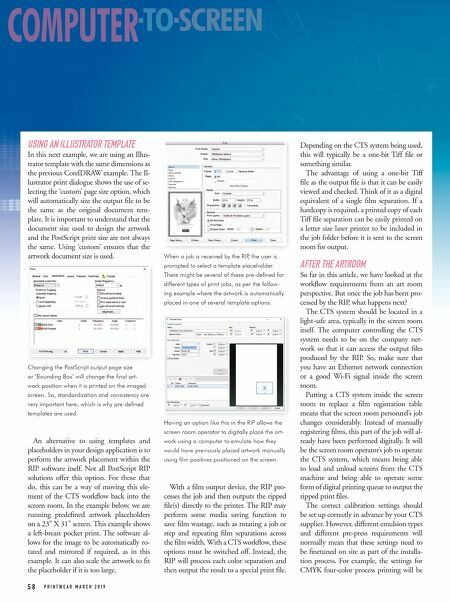 It may seem a bit daunting, but with the correct preparation and commitment, and assuming your CTS system is the right product for you, you should see immediate production ben- efits. Not to mention superior quality prints, all thanks to your new digital screen room workflow. PW The example on the far left shows the same under- base white sepa- ration printed with identical pre-press settings. The im- age on the left was produced using an inkjet film posi- tive, the one on the right uses an inkjet- based CTS system. The results speak for themselves. Below: Ultimately, the decision to invest in a CTS system should not be taken lightly. Properly planned and managed, it will reap enormous benefits both in production cost savings and im- proved product quality. A good understanding of what is needed prior to installation will help ensure that your CTS installation will go smooth- ly and will vastly shorten the time it takes before you are in full produc- tion with your shiny new CTS system.